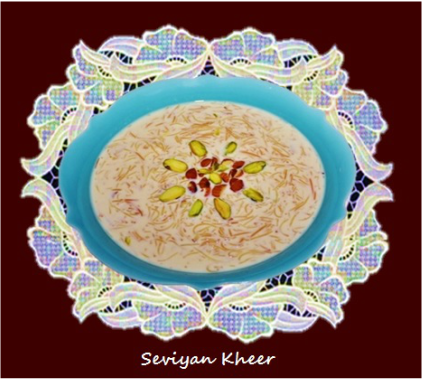 V﻿ermicelli kheer (Seviya kheer) is one of the traditional dishes of India which is made in every Indian household for special occasions like Birthdays, Rakhsha Bandhan and Eid. 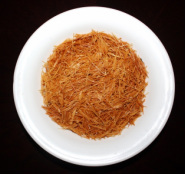 Vermicelli is also known as Semiya or Seviya. 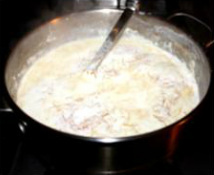 In North India it is called Seviya kheer and in south India it is called semiya Payasam. 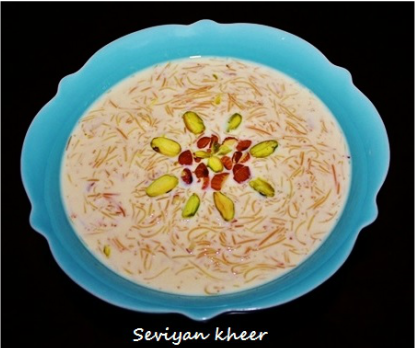 Seviya kheer is prepared with Seviya (vermicelli strands), milk and sugar, first seviya are roasted in ghee or butter which gives it a nice aroma and taste then it is boiled in milk and sugar nuts are add to it. This delicious dessert can be served either warm or chilled. This is very easy quick and effort less sweet dessert and you can make it on any day to satisfy your sweet tooth. 1. 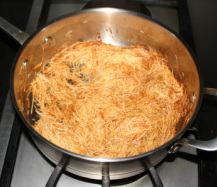 Heat a frying pan on medium heat, add broken vermicelli and butter, with the spatula mix and roast the vermicelli, stirring constantly, in about 5 minutes vermicelli will start turning brown and they will be well coated with the ghee or butter. 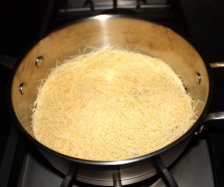 Turn the stove off and remove the frying pan from the stove so that they do not brown any more, keep it aside. 2. In a stainless steel heavy bottom sauce pan add milk and let it boil on medium heat, stirring periodically so that it does not burn from the bottom. 3. 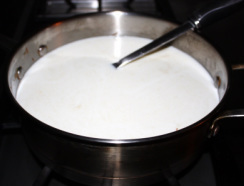 In about 15 to 20 minutes milk will start boiling, reduce the heat to medium low. 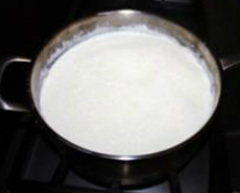 With a big cooking spoon stir the milk for few minutes so that milk stay down in the pan, otherwise it will spill out of the pan. 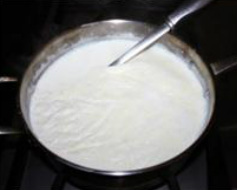 After few minutes milk will settle down, keep boiling the milk and stirring occasionally and scraping down the sides of the pan. 4. 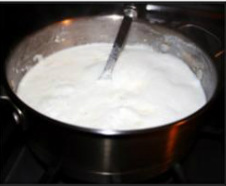 In 20 to 25 minutes milk will reduce to 75% and will become little thicker, add roasted vermicelli in the boiling milk and mix and let them cook for 5 to 7 minutes or until vermicelli become soft, if vermicelli looks thick then add some more milk to the desired consistency. 5. Add sugar, sliced almonds and pistachio and mix and cook for 4 to 5 minutes turn the stove off. 6. Serve the vermicelli hot or cold. 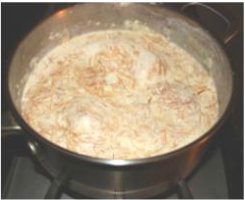 If like chilled then transfer the vermicelli kheer in a serving bowl and place the bowl in the refrigerator until it cool down. 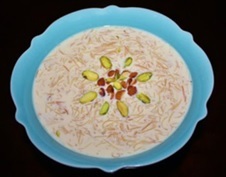 be added to the vermicelli kheer.